To tap the increasing tourist traffic in Bikaner, as well as explore possibilities of retail selling, URMUL Trust opened a retail outlet in Bikaner in 1991. Abhivyakti (expression), as the showroom was called became a window of URMUL’s work with the artisans to the tourists coming to Bikaner. It got a mention in the popular and authentic Lonely Planet travel guide, my destination and ashoka holidays as a result Abhivyakti became known to every tourist coming to Bikaner. Pattus, bed spreads, table linen, etc from Phalodi; garments, woolen jackets, dhurries, pidhas, from Vasundhara; cushion covers, bags, caps from Seemant was an expression of collectivity, a representation of URMUL Desert Crafts. all could be found under one roof. 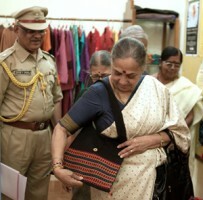 After the completion of her administrative and social duties Respected Governor of Rajasthan Margaret Alva did shopping in Abhivyakti on her visit to Bikaner. she bought the Kashida clothes done by displaced people from Pakistan.